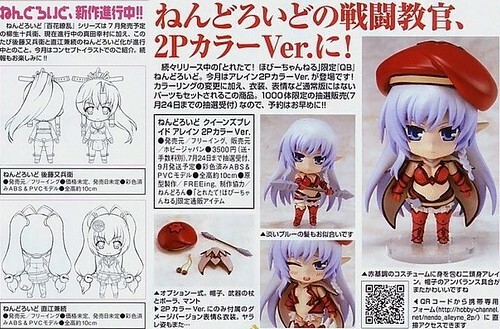 FREEing is showcasing some of their Queen’s Blade and Hyakka Ryouran (Samurai Girls) Nendoroid. 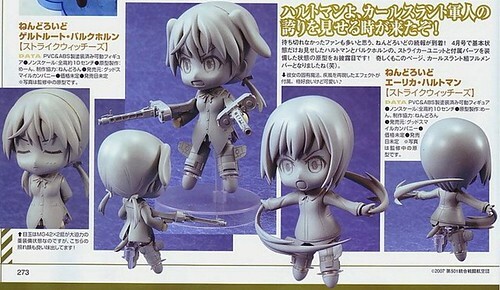 The limited-exclusive Nendoroid Alleyne: 2P version will be released on September 2011, with a price tag of 3500 Yen. She will be available for pre-order until July 24 on this page: http://hobby-channel.net/nendo_alleyne_2p (not present at the moment). One more scan can be seen after the break. This entry was posted in News and tagged magazine scan, nendoroid. can someone please tell me if naoe kanetsugu will be released in the near future or is she canceled? Nendoroid Naoe Kanetsugu from Hyakka Ryoran has not received any official announcement from FREEing – the one who usually does Nendoroid from this series.